BISMARCK, N.D. – Today is North Dakota Agriculture Day at the State Capitol. Goehring said more than 20 agriculture-related organizations, associations and agencies participated in today’s event. 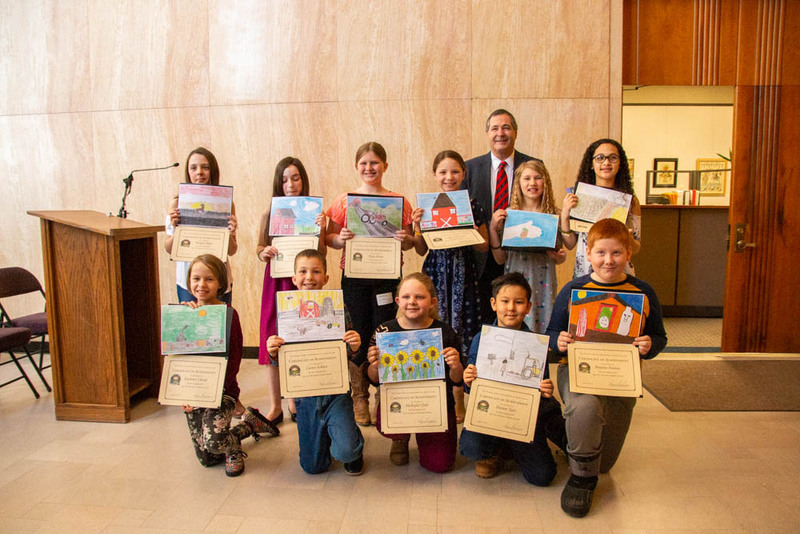 A news conference at 11:00 a.m. recognized winners of the 2019 Ag in the Classroom (AITC) Calendar Art Contest. Third- to fifth-grade students were invited to submit original artwork about North Dakota agriculture for the contest to be used in a calendar for agricultural literacy. The winners received certificates from the North Dakota Department of Agriculture and a $25 cash prize from the North Dakota Bankers Association. Their artwork will also be published in the 2019-20 AITC school-year calendar, which will be distributed to classrooms around the state. Each day will feature a North Dakota agriculture fact. A contest is held regularly to celebrate the contributions of farmers and ranchers and to increase awareness of the importance of agriculture in daily lives. The contest is administered by the North Dakota Department of Agriculture in cooperation with the North Dakota Bankers Association.